PLO Secretary General threatens to cancel agreements with Israel if Trump follows through on pledge to move embassy to Jerusalem. Saeb Erekat, Secretary General of the Palestine Liberation Organization (PLO), is threatening that the PLO will revoke all its previously signed agreements with Israel as well as its 1993 recognition of Israel if U.S. President-elect Donald Trump follows through on his pledge to move the American embassy from Tel Aviv to Jerusalem. 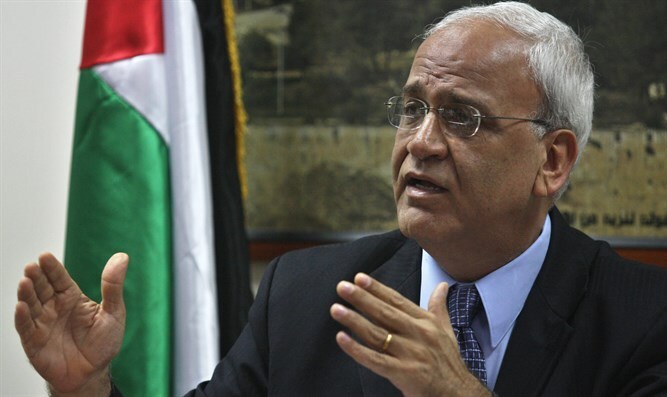 Speaking at a conference call organized by the Wilson Center in Washington DC and quoted by the Ma’an news agency, Erekat said such a move would indicate the U.S.’s acceptance of “Israel’s illegal annexation of East Jerusalem." Erekat also said he would immediately resign as the PLO’s chief negotiator if the move were to take place, because he would not want to “fool (his) people” that there were any prospects of peace, and that supporters of the two-state solution -- like himself -- would be proven wrong if the embassy were to be moved. Erekat’s threats follow his warning last week that moving the American embassy in Israel to Jerusalem would “destroy the prospects of peace” between Israel and the Palestinian Authority (PA). Trump repeatedly promised during the election campaign to move the American embassy to Jerusalem in recognition of Jerusalem being Israel’s capital city. His campaign manager Kellyanne Conway indicated last week that moving the embassy to Jerusalem "is a very big priority for this president-elect, Donald Trump." Erekat’s previous warning came a day after Trump announced his decision to nominate David Friedman as the American ambassador to Israel. Friedman said following the announcement that he looked forward to working for peace "from the U.S. embassy in Israel's eternal capital, Jerusalem". His threats come despite the fact that the PA continues to refuse negotiations with Israel, even after Prime Minister Binyamin Netanyahu’s call on PA chairman Mahmoud Abbas to sit down for direct talks without preconditions.